You probably gathered by now that breathing is the ONE. And we've explained to you how to do it right. Now that you have a handle on it and understand why it’s so important, take it a step further with our favorite exercise. The Breathing Box was designed specifically by Happy Not Perfect to lift your mood, and of course, provide instant relief. Give it a go! The benefits of breathing are far reaching, and there’s an exercise for every mood. So, how are you feeling today? When anger causes adrenaline to pump through your body, it can be easy to act or lash out impulsively. If you can acknowledge that you’re angry, you can also consciously choose to take a step back and understand the emotion in order to transform it. At the onset of anger, take a few deep breaths to quiet your neurotransmitters and calm your nervous system. Close your eyes or soften your gaze, inhale through your nose into your belly, and exhale through your nose. Notice where in the body you feel the anger. After a few breaths, focus on lengthening the exhale with a light hiss sound out the teeth, releasing any tension you feel. Repeat until you find yourself in a calmer state. 3 out of 4 of us have reported experiencing moderate to high levels of stress. Don't be a statistic! Counteract these uncomfortable feelings and find a relaxed and balanced mental health state by deep breathing. Lay down or sit comfortably and place your hands on your belly. Breathe in slowly through your nose, expanding your belly to the count of five. Hold for four counts. Slowly breathe out through your nose to the count of six. Repeat until you feel more relaxed. Your brain treats heartbreak the same way as it treats a broken leg. It’s important to give your wound time to heal, even though the wound isn’t visible. Breathe in gently through your nose, rolling your shoulders back and lifting your chest to the ceiling. Then, round your chest, rolling your shoulders forward and in as you exhale through your nose. Repeat for 1 minute, and then inhale to hold your breath for 5 counts, squeezing the spine. Breathe out a big sigh from your mouth, letting it all go. There’s no shortage of breathing exercises out there, and to make it easy, we’ve collected the best ones for you in one spot: the Happy Not Perfect app! 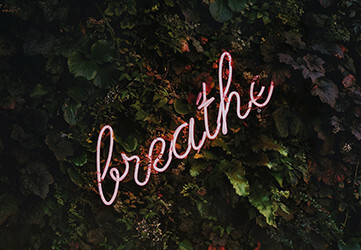 Learn how to breathe better with the guidance of one of the world’s leading experts, Dr. Belisa Vranich and try out the app for fee, over here! Choose from over 70 breathing sessions based on your current mood, situation and time. Simply open the app and select how you’re feeling or what you’d like to focus on. You’ll be taken to instructional audio and video tutorials that walk you through specific breathing techniques based on whatever you need. Try to spend a few minutes every day calming your nervous system. Your body will thank you. The secret is out. Breathing is the single most powerful tool to help you feel better 24/7. The next time you need a break or are feeling overwhelmed, stop and remember - relief is literally just a breath away. Take control of how you breathe, and change how your mind and body respond even under the toughest conditions. Take a deep breath, and we’ll see you back here soon.